Our friend Ros was not able to use her tickets so we bought them off her and had an early birthday outing for Mary. Most of the reviews out there summed up our experience pretty much - spectacular acts, especially the Wheel of Death, great live band, too much clowns. What was more interesting for me was which acts we found hard to watch. The trio of bendy Asian women appeared to have spines made of rubber and watching them made me feel distinctly queasy. Conversely Mary couldn't bear to watch anything with the risk of a fall - the high-wire act, the trapeze artiste and the Wheel of Death. I thought the teeterboard act was impressive, especially doing multiple back-flips on a mono stilt, but the wheel of death was universally singled out, quite rightly, as the massively impressive act of the show. To quote The Telegraph review "You watch with your heart in your mouth because there isn’t a safety wire in sight and the act sets the whole house on a roar of delicious excitement and dread. 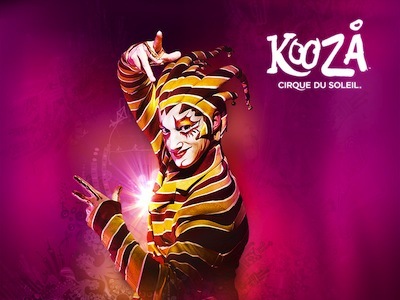 At moments like this it is easy to forgive Cirque du Soleil its cheesier excesses."